On their latest LP Magic, melodic visionaries The Werks transcend their funk rock roots while never losing their identity. Poignant songwriting and engaging improvisation come together on a record that showcases their maturation as a multidimensional group of uniquely creative musicians. The virtuosic rhythm junkies of The Werks have released four highly acclaimed studio albums over the past ten years - Synapse (2009), The Werks (2012), Mr. Smalls Sessions EP (2014), and Inside a Dream (2015) - performed well over one thousand shows (including launching their own multi-day music festival The Werk Out), and released countless live recordings including last year’s Live at The Werk Out live album. In that time they’ve earned a devoted fan base across the world and reputation as one of the most energetic, compelling, and downright entertaining live acts in the business. They’ve developed a hard won confidence, and a willingness to fearlessly chart new sonic territory on Magic. “This is our first truly multi-genre album” says Chris Houser. “Each track has its own unique vibe and sound. We didn’t write these songs to please people, we wrote them because this is what we hear when we turn off the outside and let the creativity flow.”The songs on Magic started as sketches the band members crafted independently. Coming together in their sonic dojo The Werkspace, those seeds of groove were nurtured by the group, growing into fully wrought songs. “Our writing is collaborative,” explains Dan Shaw, “but starting with demos written individually gives each band member a chance to leave their fingerprint on a tune.”The songwriting finished, the band decamped to Sonic Lounge in Grove City, Ohio. There lead engineer and producer Joe Viers (Blues Traveler, Twenty One Pilots) settled down to work with the studio’s legendary Amek/Neve 9098i mixing console. One of only thirteen in the world, Sonic Lounge’s was originally installed in Olympic Studios in London, England, where it served to document the unique creative mojo of Eric Clapton, Pink Floyd, and more. Joining Viers were assistant engineers and producers Aaron Oakley and B.J. Davis, and the unstoppable horns of Columbus’ own Hoodoo Soul Band - Chris Young (trumpet), Kevin O’Neil (tenor), and Phil Clark (Baritone) – while Kenny Holmes, tour manager and right hand man, was the gaff tape that held it all together. Finally Columbus native and current Los Angeles, CA resident Brian Lucey (Train, Dr. Dog) mastered the record. From those sessions emerged a rare jewel of a record; Magic is muse put to tape, a direct download of the creative spark. “This is a recording of the music that’s in our souls” explains Rob Chafin. “In a way, the past decade has been leading to this moment. We play and write together so seamlessly now, we’re able to channel the inspiration in our hearts out into our instruments, and come at this from a pure place.”Together, they have crafted a record where melodies take flight, dancing and twisting around the sonorous main of the tune itself. 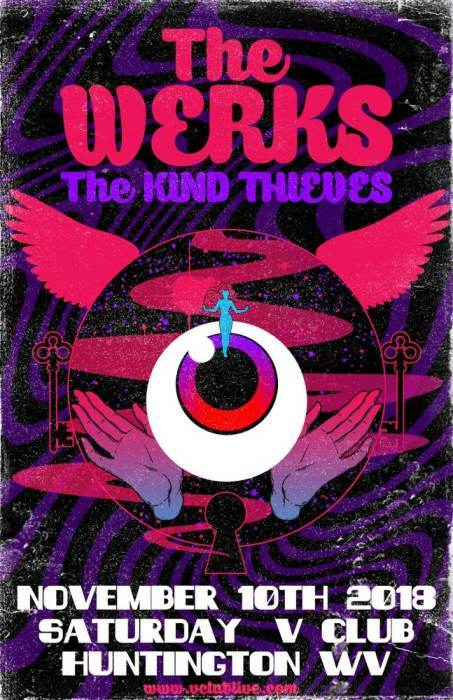 By fusing their spirited inventiveness to a core of immediately engaging songwriting, The Werks have truly performed a feat of modern musical Magic.